Tricarico Je zde 1 položka. Tricarico. "Tricaricum Basilicatae Civitas". Orig. copper-engraving from the 6th part of Latin ed. 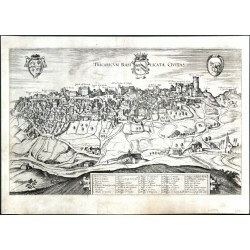 of Braun and Hogenberg's "Civitates Orbis Terrarum". Published by A. Hierat in Cologne, 1618.